We’ve long been told that aerobic exercise like running is heart-healthy. Runners enjoy a wealth of benefits like reduced blood pressure, improved cholesterol levels, and lower risk of diabetes and heart disease. But occasionally, these facts are undermined by news of runners, sometimes the very picture of good health, dying from cardiovascular conditions. The running community was shocked by the loss of Ryan Shay, who at only 28 died during the 2007 Olympic marathon trials from alleged complications related to an enlarged heart. Runners were again shaken last year by news that Micah True, beloved ultrarunner celebrated in the book Born to Run, had been dealing with cardiomyopathy and died during a routine 12-mile run. While deeply unsettling, such occasions are in fact rare. A recent meta-analysis 1 reported only .0008% deaths during or after a marathon over the last decade. Yet disturbingly, 86% of these cases were associated with cardiovascular events. If running is so heart-healthy, why are a select group not immune from – or even at elevated risk for – cardiovascular problems? Cardiovascular events are most often reported in extreme endurance runners, or in recreational athletes who’ve pushed themselves beyond their limit, suggesting that running isn’t necessarily dangerous – but excessive running might be. In fact, a recent controversial article 2 even suggested that there’s a sweet spot of running intensity and distance, above or below which your death risk increases. Although it’s doubtful that such a magic mileage range exists (see this excellent commentary on the confounds and erroneous interpretations in the former article), there is growing support for the notion that extreme endurance training may put our hearts at risk. 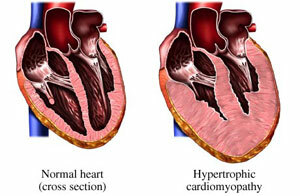 So what pushes the balance from heart-healthy to heart-hazardous running? Excessive levels of endurance running have been associated with potentially adverse structural remodeling of the cardiovascular system, such as enlarged ventricles or arterial thickening and stiffness 3. Like other stressors, running in moderation induces gradual positive adaptations, whereas in excess the body may be unable to adapt and enter a dangerous state of systemic inflammation. A recent study 4 adds fuel to this fire, reporting that ultrarunning is associated with changes in arterial compliance, a measure of the elasticity of arteries. The authors had previously shown that immediately following an ultra-marathon, arterial compliance was reduced compared to a pre-race baseline 5. Since reduced arterial compliance is related to an increase risk of cardiovascular events and death 6, the researchers wondered if ultrarunners might also demonstrate chronic changes in arterial compliance that could predispose them to cardiovascular problems. To test this, they compared arterial compliance in eighteen experienced ultrarunners (average of 37 prior ultra-marathons; average 88 km / week) to that of active, age-matched controls. They discovered that large artery compliance was lower in the ultrarunners, confirming the presence of long-term cardiovascular changes, beyond the acute changes that follow a hard race effort. They then probed the runners’ training histories and found that per-run distance negatively correlated with arterial compliance – in other words, the longer their typical run, the higher their risk. Interestingly, compliance was unrelated to other variables like weekly mileage, running intensity or number of prior races. Death to endurance runners – or running? These findings add another important piece to a puzzle that weighs heavily on the hearts of many runners (yes, pun intended). 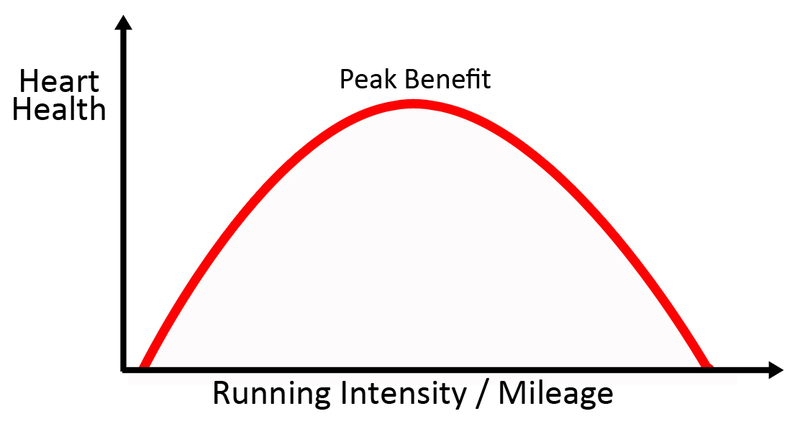 Mounting evidence suggests that the health benefits so many athletes thought they were reaping may in fact be dose-dependent, with the greatest benefits attained at moderate mileage “doses”. But exactly what the upper mileage limit might be, or how such risks are mediated by other factors (genetic, environmental, etc.) remain a mystery. Given the extraordinarily low rate of sudden death in marathoners, it’s unlikely that the average weekend warrior, or even occasional marathoner, is running above and beyond their heart-healthy zone. So will we soon witness death to the marathon or ultrarunning craze? Will runners begin cutting short their weekly long run for the sake of heart-health? Unlikely. Logically you know that ice-cream sundae isn’t adding days to your life. But you indulge anyway … because it tastes so good! Likewise, many endurance runners run for the simple reason that it just feels so good. For many, giving up that quality of life for a bit more quantity of life just may not be worth it. How about you? Would you scale back your running for the sake of your heart? Are you willing to risk running yourself “to death” for the pure love of running? Matthews SC et al. 2012. Mortality among marathon runners in the United States, 2000-2009. Am J Sports Med. 40:1495-500. O’Keefe JH & Lavie CJ. 2013. Run for your life … at a comfortable speed and not too far. Heart. O’Keefe JH et al. 2012. Potential adverse cardiovascular effects from excessive endurance exercise. Mayo Clin Proc. 87:587-95. Burr JF et al. 2013. Long-term ultra-marathon running and arterial compliance. J Sci Med Sport. Burr JF et al. 2012. Systemic arterial compliance following ultra-marathon. Int J Sports Med. 33: 224-9. Vlachopoulos C et al. 2010. Prediction of cardiovascular events and all-cause mortality with arterial stiffness: a systematic review and meta-analysis. J Am Coll Cardiol. 55: 1318-27. Tags: arterial compliance, cardiovascular, endurance, heart health, running, sports science, ultrarunning. Bookmark the permalink. Previous post ← Forefoot, rearfoot or YOUR-foot strike? I’m not sure about what the ‘sweet spot’ for running in relation to heart health is, but I am pretty sure that I’m not over it. That’s not worth giving up for anything, because something’s going to get you eventually. Couldn’t agree more! I’d rather die doing something I love than give up that passion. Great post. You are adressing some very relevant and current issues.